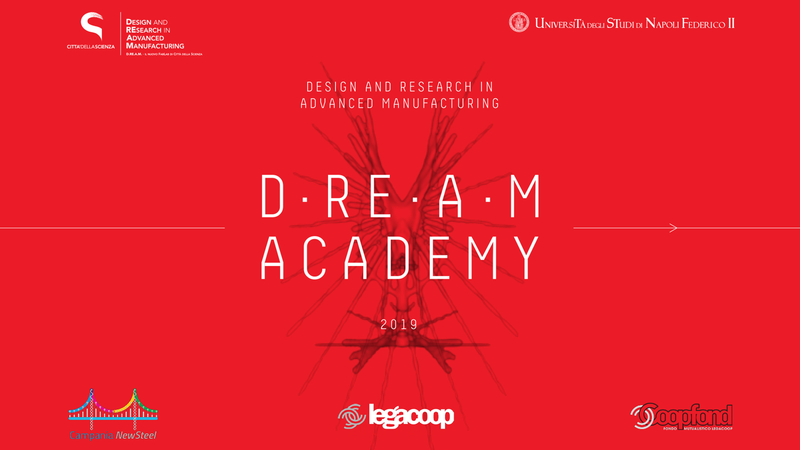 The Design and REsearch in Advanced Manufacturing Academy, D.RE. A.M. Academy, is an international advanced training programme organised in collaboration with the University of Naples Federico II dedicated to the topic of advanced manufacturing. The Academy, thanks to an international faculty, aims at the development of innovative skills, which allow participants to become well acquainted with the field of advanced manufacturing. Accordingly, participants will be able to produce original and innovative ideas and projects, which can be applied in the fields of industry, crafts and research, or can be further developed into the business path. The participants, supported by the teachers, tutors and the permanent team of the programme, will be accompanied along the path that will lead them – starting with their own initial idea – to develop a prototype, experimenting with different methodologies and design techniques and using the sophisticated machinery available at the D.RE.A.M. FabLab. The courses are organised on an average of 3 days a week from 10:00 to 18:00. The total training hours amounts to 710 hours. 5. Design Thesis & Prototype: Development of the final elaborate prototype. Each of the abovementioned parts contains different training modules. At the end of each module, students should realise their final assignment through which the knowledge acquired by the learner will be tested. Application Deadline has been extended. Application Deadline: May 31st at 19,00 CET. Information about Admission: June 5th. Payment by participants is requested by June 7th. RE.A.M. Academy will be starting on June 10th. Città della Scienza reserves to extend deadline for application and starting date of the programme.